EMS offers this kit specifically for the preparation of cross-sectional TEM (XTEM) specimens. 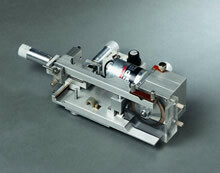 MicroSaw is a small, versatile diamond wheel saw, to be mounted under a standard laboratory microscope. The precision offered by such an optical alignment makes MicroSaw ideal for cutting and sectioning required during the TEM specimen preparation. The compact design and easy operation, MicroSaw allows the user cut almost any solid material with precisely and reproducibly prior to thinning for TEM. Thin ceramic, semiconductor material, hard metals can be further sectioned with 0.01mm accuracy! The Model MS3 MicroSaw is driven by an electric motor through a helical transmission. The 12V DC is provided by the power supply subunit. The speed at which the wheel turns is continuously adjustable. Adjustment of the specimen position, arm contact point, arm tension and the down-stop control mechanism is possible. Two adjustment screws at the bottom of the instrument allow positioning of the stand, and leveling the MicroSaw underneath of the stereomicroscopy for precision sectioning. 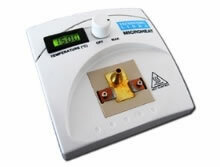 Microheat is a heat stabilized small hot plate combined with power supply designed for embedding samples and for thermoplastic gluing under stereooptical microscope. The Microheat was developed to make the embedding procedure easier. Due to its small dimensions it can be easily placed on the specimen table of the stereooptical microscope and this way gluing faults can be avoided. This result is especially important in case of samples requiring bubble-free sticking (e.g. cross-sectional samples for electron microscopy). The Model MH4 is relatively simple to operate. The temperature of the hot plate can be adjusted continuously in a wide range and is kept constant by the built-in electronic. A control circuit maintains the temperature of the heated surface within +5 degrees Celsius. The actual temperature is displayed on the top of the tool. The temperature of the heated surface usually reaches the preset temperature within 1-3 minutes. We now offer a convenient, specially designed embedding ring for cross-sectional samples, shown schematically in Figure 1. Ti disc is also offered for embedding bulk samples of brittle material for plan-view TEM investigations. The rings come in 5 sizes, 0.6, 0.8 1.0, 1.2, and 1.3 mm. 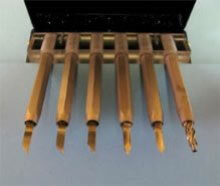 The mechanical sample preparation prior to thinning requires custom made mechanical hand tools. Containing six handy, reliable pieces, this kit has been designed on the basis of practical experience of many users. Some of the tools are suitable for adjusting the sample pieces into the Ti discs, others for removing the excess glue and cutting, or adjusting the seat plate of the sample holder.